I’m going to be doing a lot of baking for an upcoming party, so I’m getting organized and deciding what to make. I need a non-chocolate cupcake recipe, and thought long and hard about making cupcakes with the outstanding recipe for Bill’s Big Carrot Cake. As good as I know that would be, I decided to do a trial run of a recipe for Pina Colada cupcakes. They sounded so festive, and I think the name alone would make them a crowd-pleaser. The verdict? These are going on the party menu! My husband and I and my parents all thought these were great. The cake is super moist, with some chewiness from the crushed pineapple and coconut. I topped them with cream cheese frosting, which I had on my mind since I was thinking about carrot cake. I added some rum to the cake and the frosting, but they didn’t have much of a rum flavor. I wonder if rum extract would add more flavor, or maybe dark rum (I used white), but these were really good as I made them. I also changed up the recipe by substituting nonfat yogurt for buttermilk. My version of the recipe is below. Preheat oven to 350° F (180°C). Line a muffin pan with 12 paper liners. In a small bowl, whisk together flour, coconut, baking powder, baking soda, and salt. In a large bowl, whisk together sugar, oil, rum, and egg until smooth. Alternately whisk in flour mixture and yogurt, starting and ending with flour mixture (three additions of flour and two additions of yogurt) until smooth. Stir in pineapple. Scoop batter into prepared pan. Bake in preheated oven 20-25 minutes, or until tops of cupcakes spring back when lightly touched. Let cool in pan on wire rack 10 minutes. Remove cupcakes from pan and cool completely on wire rack. 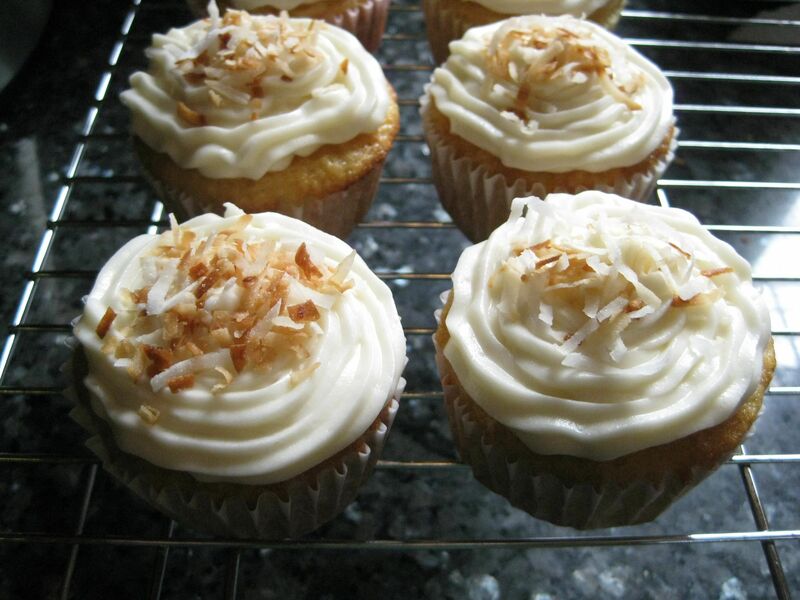 Top with cream cheese frosting and a sprinkle of toasted coconut. I used this recipe, for the frosting but used 1 tablespoon of rum and 1 tablespoon of milk instead of 2 tablespoons of milk. These look and sound delicious- pineapple makes everything so sweet and moist. I haven’t made the Bill’s carrot cake yet, but it’s on my list! I hear it’s great! You can never go wrong with crushed pineapple! These sound and look super yummy!!!!! What festive cupcakes! I’m a big fan of Bill’s Big Carrot Cake but never thought of cupcakes. Well, I certainly wish I was coming to that party. These sound like a little taste of tropical paradise! So pretty, too! These sound good and are so pretty! I’m really glad that the party was such a success!! MMM, pina colada is so yummy. Great for Summer!